Update from the Alumni Schools Committee of Eastern Mass. More Princeton alumni participate in the work of the Alumni Schools Committees world-wide, than any other alumni activity. Interviewing local applicants, staffing booths at college fairs, celebrating and “wooing” the students who are admitted, and sending off the students who choose to attend Princeton form the bulk of this volunteer service to Princeton. In addition to our local work, Boston area interviewers provide crucial assistance via telephone and skype interviews to national and international regions which lack sufficient interviewer capacity locally. Road trips to large boarding schools for pre-set interviewing days at Philips Academy, Philips Exeter, and St. Paul’s School also rely on Boston area interviewers. 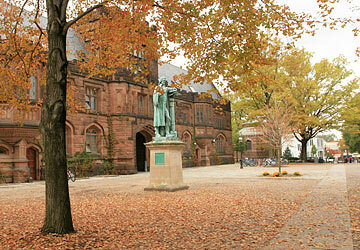 On November 1, Early Action applications are due for the Princeton Class of 2017. Volunteer alumni interviewers will meet and report on roughly 100 applicants before December 1. In January and February, we’ll be interviewing approximately 500 local Regular Decision applicants.